Jascha Heifetz's birth place is Vilna (Vilnius), the capital of Lithuania. Vilna's population today is well over half a million, but at the turn of the 29th century its population was about a quarter of that. Lithuania as a whole, and Vilna in particular, had geographically served as a buffer between Europe and Russia. Throughout history it was conquered invading armies that wished to occupy Russia, from Napoleon through to the Germans in the two world wars. Vilna was home to a large and flourishing Jewish community which, in the late 1890s and early 1900s, numbered over a third of the town's population. It was into this community that Heifetz was born, with a sense of traditional belonging instilled in him by his rabbinical grandfather. Hebrew scripts and alphabet, along with Yiddish, the local Jewish language (which was spoken at home) were the first languages that he had learned in his infancy. The Jewish community prospered in Vilna and many scholars, rabbis and leaders rose to prominence amidst their fold. "In Vilna even waiters read poetry", novelist Bashevis-Zinger once said. The Jews loved the place with its picturesque Neris River and the beautiful surrounding lakes - they nicknamed the place "Upper Jerusalem". During WWII the Jewish community was devastated by the German occupation. Many were executed, others transported to the death camps. Remaining survivors scattered around, many of them immigrating to Israel. Today the Jewish community is very small with its former glory seemingly gone forever. Heifetz started to play the violin at the age of three, under the tutorship and watchful eye of his father. Rubin (Ruvin, Reuven) Heifetz was a gifted, if largely uneducated fiddler who for some time found employment by playing at local festivities, weddings, etc. His friend Elias (Ilyia) Davidovitch Malkin, also a violinist, was considered a better musician, having studied the instrument with none other than Leopold Auer in St. Petersburg (somewhat before the 'deluge' of wunderkinder whom Auer later taught). Just before the turn of the century Malkin had tried to set up a local Jewish theatre and had invited Rubin to become its small orchestra's concert master. The theatre. alas, survived only one season before closing down, but Rubin could by then add the distinguished 'concertmaster' title to his CV. It was some five-six years before their path crossed again; by now Rubin was married to Anna Heifetz, and had been coaching little Jascha for some two years on the violin. Malkin listened to the boy and could hardly contain his astonishment. He immediately enrolled the boy as his pupil at the local Imperial School of Music. At the age of six, little Jascha appeared in his first public concert in the overcrowded Imperial Music School auditorium, plying the Fantaisie Pastorale. The little boy's playing is said to have overwhelmed the audience. Of similar size to Vilna, Kovno (Kaunas) was also home to a large and prospering Jewish community. Tragically, that community was savaged during WWII by the Germans. Only about a year after his first public concert in Vilna, little Jascha fulfilled his first 'truly professional engagement' in Kovno where, at the age of seven, he played the Mendelssohn Violin Concerto! "I took care of my family since the age of seven, and I am proud of it" - would the great violinist reminisce some 70 years later. The St.Petersburg State Conservatory, the first public school of music in Russia was inaugurated on September, 20th, 1862. The foundation of the Conservatory was the crowning efforts of a group of progressive-minded musicians of the XIX century. It included the names of Anton Rubinstein, Henryk Wieniawski, Karl Schubert, Gavriil Lomakin as founding members. By that time the distinctive features of Russian musical performance style was competing successfully its their foreign counterparts in the various Imperial and private opera companies, ensembles, orchestras and choirs abroad. Musicians from Italy, Bohemia, and Germany would flock to Russia and in many cases would settle there. In the first half of the 19th century, St. Petersburg was regarded on a par with Vienna, Paris, Prague, London and Berlin and started attracting world-famous artists. 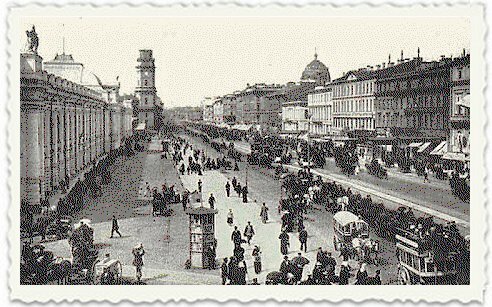 Among the renowned performers who visited St. Petersburg were Liszt, Berlioz, Schumann and Wagner, to name but a few. It was in St. Petersburg that a remarkable school of composition began to flourish, which was to shape and evolve - through the works of Dmitry Bortnyansky, Alexander Dargomyzhsky, Mikhail Glinka and their contemporaries - the distinguishing features and idiom of Russian music. From its incipience the St.Petersburg Conservatory was headed by the pianist, composer and conductor Anton Rubinstein. The initial staff members were Henryk Wieniawski (violin), Theodor Leszetycki (piano), Anton Rubinstein (piano), Nikoly Zaremba (composition), Karl Schubert (cello), Gavril Lomakin (choral singing), and others. In 1865 the Conservatory gave the world its genius alumnus - Pyotr Tchaikovsky. The period between 1870-1890 saw the ascendancy of the Conservatory with the advent of Nikolay Rimsky-Korsakov and his disciples, the exponents of the New Russian school of composition - Anatoly Lyadov and Alexander Glazunov. Glazunov eventually became the Conservatory director and remained its head and soul as well as professional and moral symbol, for nearly a quarter of a century (overseeing the 1917 Revolution transition). The illustrious musicians, who were members of the professorial staff then, were Leopold Auer (violin); Nikolay Tcherepnin (conducting); Anatoly Lyadov, Alexander Glazunov and Maximilian Steinberg (composition); Anna Yessipova, Sergey Lyapunov and Leonid Nikolayev (piano. Many of their pupils from that period won world acclaim: composers Nikolay Myaskovsky, Sergey Prokofiev, Dmitry Shostakovich; pianists Samary Savshinsky, Nadezhda Golubovskaya, Vladimir Sofronitsky; conductors Nikolay Malko, Mikhail Klimov; violinist Miron Polyakin, Efrem Zimbalist, Mischa Elman, Toscha Seidel, Yuri Eidlin and of course Jascha Heifetz. 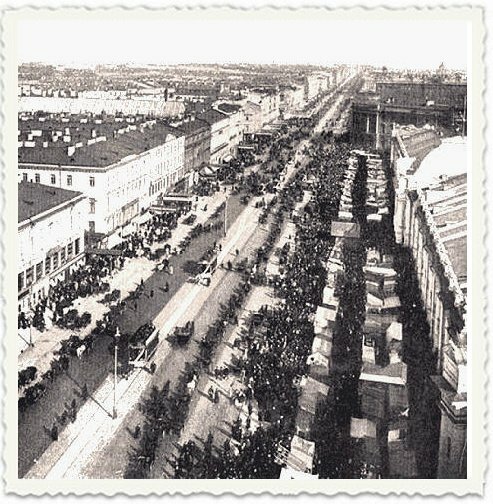 St. Petersburg proved to be a 'new world' for the 10-year old Vilna-boy Jascha, who arrived in the city with his father to commence studies with Auer. The large city, the wide boulevards, the exquisite architecture of the "Imperial Winter City" left a marked impression on the child. Glazunov was instrumental in securing the permit for the Heifetzes to live in the city - by enrolling the father as a 'violin student', thus allowing his family leave of stay. Inspired no doubt by the new surroundings and a new, great pedagogue, Heifetz progressed rapidly. A year later Auer had already presented him in a concert at the Conservatory, with the director Glazunov attending. The same year he made his recording debut with two short pieces, and in the summer of 1912 the Heifetz family already accompanied Auer on his vacation at Loschwitz spa, as they would every summer thereafter. Command performances followed forthe Russian Tzar and the King and Queen of Norway, concerts and recitals in St. Petersburg, Berlin, Odessa, Oslo and Copenhagen, and other cities. The young Heifetz name spread throughout Russia and his concerts became eagerly awaited events, with overbookings and crammed halls becoming a regular feature. Heifetz spent almost seven years in St. Petersburg with Auer until the dark clouds of the bloody Revolution began to shadow Russia. The Heifetz fame had by then already crossed the ocean, mainly by word of mouth of visiting musicians who had heard the boy. Albert Spalding for example, had visited the Auer Conservatory class in 1913 and was shaken to the core when he listened to the 12-year old boy's playing. Fritz Kreisler was similarly shocked when after the Heifetz Berlin concert, at a private party, he actually accompanied the boy at the piano and later decreed to the attending musicians (mostly violinists): "We can now all break our violins across our knees". The rumors of the wonder-violinist had thus reached the Wolfssohn Music Agency in New York which extended a 50-concert contract for Heifetz to play in America. The dice was cast. This southern Black Sea resort and port city - another beautiful example of traditional Russian architecture - became famous as the birth place of several famous violinists, such as Nathan Milstein and David Oistrakh. It was also famous for its local violin teacher, Piotr Stoliarsky who had developed his individual schooling system, of which products were both Milstein and Oistrakh as well as Leonid Kogan. "One fine day (this must have been in 1911; I was still seven years old), Mama announced: 'We're going to a concert today. The wunderkind Jascha Heifetz is playing'. "What ultimately made the greatest impression on me came when Jascha Heifetz finished playing. Immediately he was surrounded by imposing Russian policemen. I thought they were arresting him. Actually, the police were there to protect Heifetz from his frenzied fans. Odessa is a southern city. The audience there are temperamental and express their delight raucously... Mama and Papa, like the rest of the audience, were delighted with little Jascha's playing... I didn't know then that my fate was sealed and I was going to become a violinist". The name Loschwitz is actually a district of Dresden, Germany. It is a villa quarter located in the north of the river Elbe, which used to be a spa. It is flanked in the North by the Weißer Hirsch district and by the Blasewitz district in the South, Wachwitz in the East, and the Rosengarten to the West. Loschwitz is connected with Blasewitz by the bridge Blue Wonder (Blaues Wunder). A very popular place for tourists in Loschwitz, which is located on two hillsides, is the gazebo Luisenhof. There, the oldest endless rope haulage system and the oldest suspension railway in the world can be found, which are still in use. Nobility and rich citizens of Dresden used to live in Loschwitz - some owned summer houses in town: Heinrich Schütz, Theodor Körner, Carl Maria von Weber and Gerhard von Kügelgen. A large number of famous people either traveled through, or stayed there for a short time: Goethe, Schiller, Kleist, Arndt, Novalis, Tieck, Humboldt, Mozart and Graff. During the 1920-1930s Loschwitz also enjoyed the distinction of being the most expensive living region in Europe. It was in this town that Auer chose to come during his summer holidays. Those chosen pupils from the St. Petersburg conservatory and their respective families, as well as invited international students, accompanied the professor and lodged in the various hotels and guest houses. Apart from its pleasant atmosphere and clean air, Loschwitz was also chosen by Auer as his European base for concerts and professional relations. Born in Veszprem, Hungary, in the heart of Europe, and having traveled quite a bit in his youth, Auer knew well the places where artists congregated, were artistic connections can be made and where his pedagogical authority and fame can be enhanced abroad. Loschwitz was the place where he accepted summer students from other countries, such as Isolde Menges (England), Ruth Ray, Eddy Brown, David Hochstein and others (USA), etc. Music centers such as Vienna, Berlin and even Paris were not far away. From Loschwitz Auer could negotiate Jascha's (and Seidel's) debuts in these cities as well as presenting his pupils in local music soirees in front of selected audiences. Loschwitz summers were memorable escapades for the young Heifetz, where he got accustomed to European etiquette, mentality and manners. He never forgot them.